This post reviews the current meta, based on the replays available for the recent tournaments. It provides some insight into what the meta in a competitive setting is. This might be useful to answer question that frequently pop up regarding commanders or build orders, and also gives some basis for some balance and game design discussions. The goal specifically is NOT to find out what "the best" meta is because this likely is still a matter of personal preference, skill level and other variables. Replays were used irrespective of the player's ranking so the meta here does not exclusively reflect that used by top players. However, in knockout tournaments better players tend to advance so they will also contribute more replays to the total data set. Originally, it was planned to do this based on the War Paint Championships replays only, however one poll and some discussion later, I decided to include the replays from Tric's tourney (TT) as well. To increase the number of available replays (WPC: 117, TT: 46); WPC in particular had a very low number of replays with UKF. Looking at player's choices during ESL showed that the meta is still a matter of personal preference. Adding the replays from Tric's tournament (TT) effectively added more games from other top players that got knocked out early during WPC and thus providing a more representative overview of which meta top players currently perceive as viable. The basic stats for WPC can be found here. There is no stat post for TT, but the faction and matchup stats actually are very similar to those for WPC. The only exception is that UKF was more successful, mostly due to HelpingHans games against BartonPL, Theodosios and Talisman. It has to be noted that the replays are only a subsample of all games of those tourneys. Extracting teching choices and build orders (BOs) from replays is tricky because those note only when the command to build a unit was issued, not when it arrived on the battlefield. Likewise, while "cancel" orders are part of the replay files, but vault (the backend to cohdb) that is used to decode the replays does not define which build was actually canceled, so there is no guarantee that the BOs below are 100% accurate. In total there are replays for 101 OH games. For charts relating to commanders, an additional four games were sampled from casts of the gameplay. 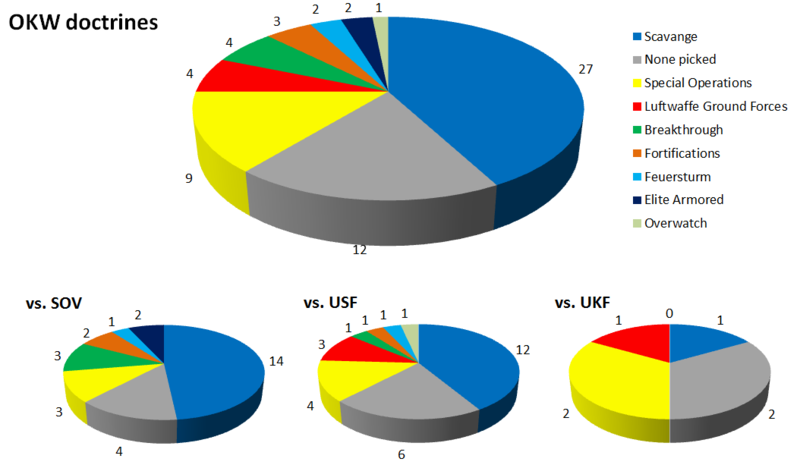 49 games were played against SOV and USF each and eight games were played against UKF. The diagrams below show the commander choice in total and per opposing faction. The "other" category contains Storm, Assault Support and Jaeger Armor (vs. SOV), as well as German Mechanized and Festung Support (vs. USF). The top 4 commanders picked in the recent tournaments were also in the top 5 most used commanders during ESL. German Mechanized - the third most frequent ESL pick - seems to have fallen out of favor. In these tourneys, Mechanized Assault was firmly the top pick. It was used in more than half of the games against SOV. 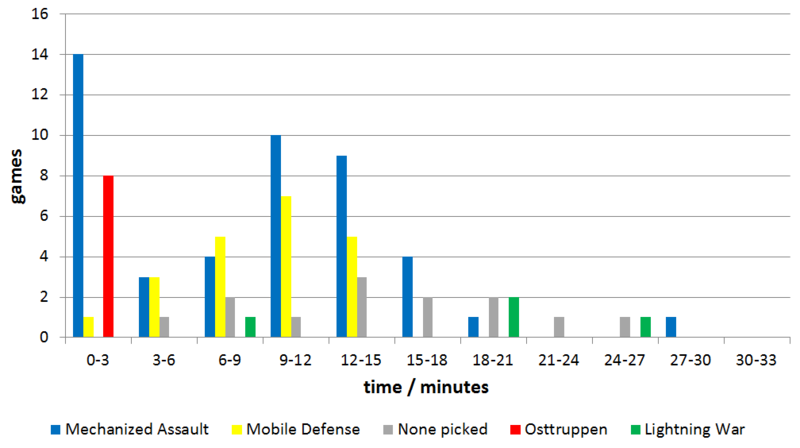 Versus USF, Mechanized Assault was still the most used commander, although barely beating Mobile Defense. Osttruppen - the second most frequent ESL pick - was used significantly less. The charts for WPC and TT is very similar, apart from the state of Osttruppen vs Mobile defense picks. Osttruppen were used slightly more often than Mobile Defense during TT due to HelpingHans using them as his primary doctrine. This is somewhat remarkable as HelpingHans was the main user of Mechanized Assault during ESL. The table above shows which player used which of the top five doctrines; the number in brackets behind the names indicate the number of games played with this commander. While some players seem to start with a fixed game plan, regardless of the opponent or map (like Hans always picking Osttruppen), others like DevM, VonIvan or Theodosios seem vary their picks based on the situation. The diagram above shows, when the top five "commanders" were picked in three minute bins; "None picked" refers to games that ended before a commander was picked. Osttruppen unsurprisingly was picked right away. There were also a lot of games in which Mechanized assault was picked very early on, although build orders (see below) indicate that an Assault Grenadier starts were extremely rare. 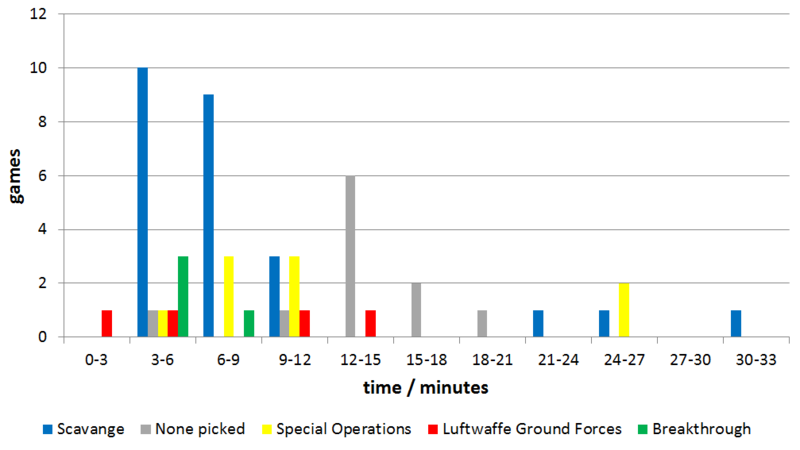 Most Mechanized Assault picks, however, happened at around minutes nine to twelve, similar to Mobile Defense, likely as a response to the appearance of allied vehicles. The diagram above shows how often the individual commanders were in loadouts. Mechanized Assault and Mobile Defense were used in about 80% of the loadouts. Jaeger Armor, Osttruppen and German Mechanized all have been in about a dozen of loadouts, but out of those Osttruppen was the only one that saw significant usage. The table in the spoiler below shows the specific loadouts in order of how often they were used as denoted in the first column. The other columns specify commanders and by which players the loadout was used (the number in brackets is the number of games). The final column says in how many games against the different factions this loadout was used. Only loadouts that have been used more than twice are listed. As expected after the previous diagram, most loadouts are Mechanized Assault and Mobile Defense plus a third doctrine. Most popular as third doctrine are Lightning War, Elite Troops and Osttruppen, in that order. This section - looking at teching and units built - is based solely on the 101 OH games for which replay files are available. Conveniently, this means that the number of games is almost always identical to the percentage of games. The table above shows some of the teching choices including which players used them. The last column shows the commander list for that specific teching choice. Since T1 and T2 have been built in almost all games, the ranking of commanders is very similar to the overall ranking. In the summer patches, the costs for T3 and T4 were slightly lowered in order to make them more accessible. However, that did not seem work out that well. First up, T4 was build in only 7 games, so T4 wasn't a thing. But even T3 was build in only 32% games as might be expected from the commander choices. In fact, the commander that was used mostly when T3 was build was Osttruppen. In 66 games neither T3 nor T4 was build! While OH teching is linear, the tech buildings don't need to be constructed in order. Yet, tech buildings were not skipped often. T1 was skipped for T2 in only ten games (it's later back-teched in four of those), most of which played with the Osttruppen doctrine. T3 was skipped for T4 in only 3 matches. In seven games, T2 was skipped initially. The following tables show the amount of units built during the tournaments divided in buildings/mines, infantry and vehicles. The column "total" denotes the total number of times this unit was build; "games" is the number of games it was build in at least once. And the last column, "of", denotes in how many games the unit could have been build. For example, Grenadiers were only an option when T1 was built, which was the case in 95 of the games. Likewise, doctrinal units (marked in blue) can only be build when an appropriate doctrine was picked. The table above shows the mines and buildings built, excluding tech buildings. Also, bunkers themselves are omitted, but their upgrades are listed. The point "Osttruppen (Mob. Def.)" refers to invoking the commander ability in the Mobile Defenses Doctrine, which results in twice as many Osttruppen. The Panzergrenadiers have been upgraded with Panzerschrecks 43 times. Overall, the table shows that Grenadiers and MGs are built in almost all games. Mortars, however, are build in only about a third of OH matches. 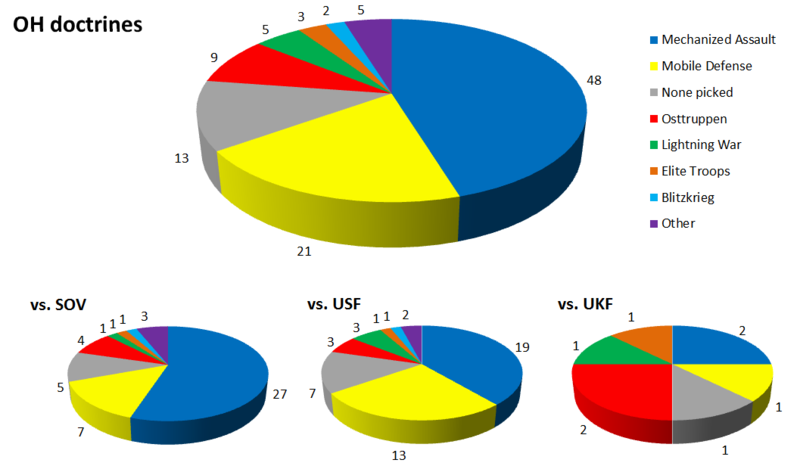 Snipers were fielded in about half of the games (vs. SOV: 39%, vs. USF: 53%, vs. UKF: 50%). As expected the 222 is the most built OH vehicle. Since replays do not contain if or when a unit was destroyed, it is not possible to determine how many 222s were fielded simultaneously. However, a list was made of how many build orders for 222s were placed in the first ten minutes of a game. In 38 games no 222 was build in the first ten minutes whatsoever. Then there are 47 games with one 222, 13 games with two 222s, 2 games with three 222 and one more than four. Again, in some cases the later 222s might replace 222s that have been destroyed in the meantime. But even assuming that none of the 222s were trashed, the dreaded 444 appeared in only 16 games max, and higher counts of 222s barely ever happened at all. The Panzer IV was the most commonly fielded T3 unit, but was build in only 21% of games. It was hugely outnumbered by StuG-Es and Pumas. There were more Tigers fielded than StuG-Gs or Ostwinds. The Mechanized Assault Group was called in more often than all T4 units combined. The SdKfz. 251 half-track was fielded in 16 games. It was upgraded with flame projectors five times, which conversly means that it was used for reinforcement in about 11% of games. The CP4 unlocks slighlty later than the other two vehicles, so it is not surprising that slightly more of them are called in beyond BP2. Still, all three vehicles are mostly called in before that. So, tying them even to BP2 would most likely result in a shift of the OH meta. It turned out that BOs are pretty diverse for OH. Tracking builds/call-ins (excluding teching, bunkers or caches) to the fifth unit resulted in 69 different BOs. The best way that I found to display them is presented in the table in the spoiler below. The unit that was most commonly built first was the MG42, which was the first unit in 64 games. When the MG42 was the first unit, five different units were used as second unit: A gren squad (48 games), a sniper (eight games), another MG (five games), a pioneer (two games) and then one game with assault grenadiers. If we assume that the second unit after the MG was the gren squad, there were 40 games where the third unit was yet another gren. Then in 22 games the forth unit we had another gren, and finally, the most commonly used BO was a yet another gren as fifth unit, so we had MG + 4x gren in 10 games and 3 games with MG, 3x gren, 222. The most commonly used BOs ended up after five units with in total 1x MG, 3x gren + x. Snipers were mostly fieldes as second unit. In the eight games with Osttruppen Doctrine, the grenadiers are replaced with osttruppen. However, even given the large number of games with Mechanized Assault and the overall insignificant number of assault grenadier squads fielded, there was only one game were grenadiers are replaced with by those call-ins. Nevertheless, the table contains some really weird BOs, for example tripe MG42, Pio into 251 HT. Note again that these build orders are subject to limitations of the replay file and the reader, so the order is in which the build orders are placed and also not all 'cancel build' orders might be interpreted correctly. There are 61 replays involving OKW. Together with three commander choices taken from casts, the total number of OKW games is 64, 29 games against each of SOV and USF and six versus UKF. For OKW, the top three doctrines are identical between WPC and TT. However, a notable difference was that during TT, games ended more often with no commander picked than Scavenge. Back during ESL, Luftwaffe Ground Forces was dominant due to being the more viable of the two doctrines providing an MG34. This changed in the summer patch so it now ended up among the lesser picks, not being selected once against Soviets. The dominant doctrine now is Scavenge with Special Operations already a distant second. The table above list players and games for the top five doctrines. There are very few early commander picks for OKW (see above), although Scavenge is mostly picked in the first nine minutes, typically before the Ostwind would be available. In fact, most loadouts consisted of Scavenge, Special Operations and an arbitrary other doctrine (see spoiler below). In most cases, this third doctrine was Breakthrough, although this specific loadout was never used vs. UKF. The most used loadout there was Special Operations, Fortifications and Luftwaffe ground forces, but the number of games against UKF was so small that this result is not overly significant. The following sections are based on the 61 OKW games for which replays are available. The table above shows the frequency of mine and static unit construction. The table above shows the infantry units built during the tournament. Volksgrenadier (VG) squads of course where the most built units. The raketenwerfer, being built in about 90% of games was somewhat more popular than the Pak40 (67%), while the MG34 was used in only 62% of games. This is drastically different than the 90% for the MG42. The most popular elite infantry unit were Jaeger Light Infantry which were filled in more games than Obersoldaten even though the latter were available in more games. LeiGs were built in about half of the games in which a Battlegroup HQ (BGHQ) was built. The most commonly fielded medium tank was the doctrinal Ostwind. The most commonly fielded vehicle from T4 was the Panzer IV; Panthers were as rare as Sturmtigers, Jagdtigers or even IR Halftracks. The table above summarizes most teching choices. The green percentages are based on all 61 games. The blue percentages for the upgrades are computed based on only when the tech was built. For example medics were researched in 92% of games that saw a BGHQ. OKW experienced the most significant changes in the patches after the ESL. Initially, there was some concern in the forums that everybody would rush a Luchs and obliterate the opponent early on. However, it turned out that a BGHQ was more popular than the Mech.-Regiment: BGHQ was the first tech in 67% of games, Mech.-Reg. was the first tech in only 31%. Overall, the BGHQ was built in 87% of matches so even with a Mech.-Reg. start it was common to back-tech to T2. Mech.-Reg. was build in 56% of games and T4 in 57% (compared with only 21% of OH games that saw a T3). So, even though the BGHQ was available more often than Mech.-Reg., more units from the latter were built (36 vs. 39), so unsurprisingly healing might be the most significant factor in this decision. Consequently, the medics upgrade was skipped in only 8% of the games that saw a BGHQ (for comparison, the retreat point unlock was skipped in 87%, the mechanics from Mech.-Reg. in 41%). Similarly to OH, call-in tanks - specifically the Ostwind and the Command Panther - were used frequently. However, unlike OH these were often not used to circumvent teching: In 11 games T4 was already built when the first Ostwind was called in, vs. eight games were T4 was not yet available. The ratio for the Command Panther was six (with T4) to two (without T4). The table in the spoiler below contains the BOs for OKW. There is about a 50:50 split between Volksgrenadier and a Kübelwagen as first unit. The most commonly used BO was VG, Kubel, VG, VG, medics (BGHQ), which was used in six games. Most BOs contain three, occasionally four VGs. Luchs' and most BGHQ upgrades appear as the fifth unit. Given that the MG34 - the former main selling point for Luftwaffe Ground Forces - is now available non-doctrinally, it is no surprise that the previous runner-up, Scavenge is now the most used OKW doctrine. The reason why Mechanized Assault has risen to the top of the OH doctrines is less clear. While it was always considered a strong doctrine, the nerf to the Tiger (along with the other heavies) and the price decrease of T3 and T4 could have made other doctrines feasible. Yet, here we are with Mechanized Assault being the dominant OH doctrine. Fun fact: The players that almost never used Mechanized Assault during ESL (e.g. Luvnest and Talisman) now used it in all their games, whereas the top user during ESL, HelpingHans now used the Osttruppen Doctrine exclusively. OH and OKW meta is similar in that the commander loadouts consist almost exclusively of their top doctrine and the already distant second most doctrine plus one additional doctrine that almost never gets picked during the matches. They also have in common that these top doctrines contain strong call-in vehicles. The effect of the call-ins, however, seems to be different. In the OH case they are commonly used to avoid teching past T2. For OKW on the other hand, T4 is mostly available when the call-ins arrive. The reason for the strong use of call-ins is most likely their higher cost efficiency. This is especially true due to the patch in December of last year, where the Ostwind was spared from the fuel price increase that most other OKW medium and heavy tanks saw. Additionally, call-ins have lower opportunity costs due to them not having any build time. Otherwise, OKW teching seems to be fairly balanced between BGHQ and Mech.-Reg. with about a two-thirds/one-third split. It should also be taken into account that in team games where the teammate can provide healing Mech.-Reg. potentially becomes more attractive. For OH it is obvious that teching past T2 is perceived as unattractive compared with relying on call-in vehicles.